Soon, we will be celebrating Hari Raya Aidilfitri and already the highways are heavy with traffic moving out of Kuala Lumpur and the Klang Valley. It is that time of the year when most city dwellers will be making that temporary migration en masse back to their hometowns or as we affectionately call, the kampung. This massive exodus, which typically takes place on the Aidilfitri and Chinese New Year holidays, has unofficially become a significant part of Malaysian culture. This balik kampung phenomenon is an apprehension that despite having a comfortable livelihood in the city, there is always that need for us Malaysians to return to our roots in the kampung. While many of the younger generation were born and raised in cities, the balik kampung culture has been so strongly embedded in our society that even this generation identifies the kampung as part and parcel of their life. However, there is no denying that there are some who have permanently adopted the city as their hometown and no longer have a kampung to go back to. This is quite evident in Kuala Lumpur, which is no longer the strangely deserted city on Aidilfitri as it was in the ‘80s. Kuala Lumpur is now their hometown. And there are also some who take the long holidays as an opportunity to travel abroad for vacations. My family and I will be spending the first few days of Aidilfitri in Putrajaya and Kuala Lumpur, as I have done in years past. Nonetheless I am also thankful to have many reasons to return to my hometown in Pekan and not just for Aidilfitri celebrations. At the same time, the kampung is also experiencing socio-economic change. In October last year, the Government launched a Rural Development Master Plan to address the challenges and issues faced by rural communities and village folk, and transform the rural areas of the nation. The plan aims to increase economic and entrepreneurial opportunities for the Rakyat residing in rural areas, yet without sacrificing the environment as well as the valued traditions and cultures that stemmed from this environment. 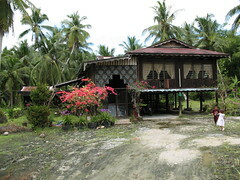 As more and more rural areas undergo the transformation of development each day, the unique connotation of a kampung remains as an important element in both our cultural and economic framework. For example, cottage industries are still an important section of our economy, producing local products such as batik, songket and food products such as dodol and keropok. These products are no longer necessarily manufactured in a traditional kampung set-up but are now mostly manufactured with advanced machinery assistance in industrialised workshops and factories. Despite so, these products continue to possess the indelible charm of the kampung lifestyle, and will continue to be created within the sphere and structure of a kampung that we know. My late father was a strong champion of economic development in rural areas in his time, particularly in his role as Minister of Rural Development. Under his ministry, roads and bridges were built to increase land connectivity; schools, clinics, community halls were constructed; a network of water and electricity supply began to spread, and modern agricultural processes were introduced. These days, programmes such as the annual Karnival Usahawan Desa continue to help improve the economic welfare of village entrepreneurs by offering assistance and guidance to realise the market potential of their products, including to overseas markets. As we move on towards becoming a high-income nation, we should never abandon that one place we call our kampung halaman or hometown, no matter how modernised it has become. Whether your kampung is in the growing townships or in the heart of rural Malaysia, I hope you have a safe journey back to your kampung to celebrate Aidilfitri. To Malaysians of other faiths, I hope you have a pleasant holiday and that you join your Muslim friends in celebrating this wonderful Aidilfitri.